You should try checking out this Facebook post about an "endangered T-Rex" if you're having a bad day. Take a look to find out why it's viral. 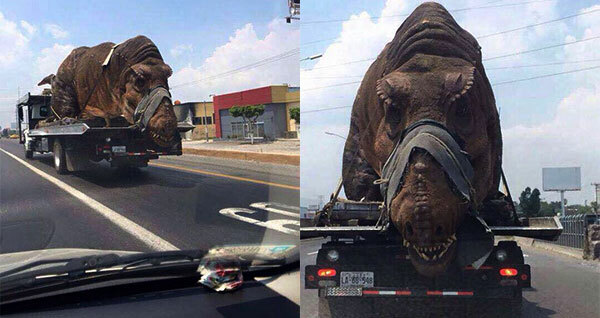 Writer and social media influencer Jonathan Chase from Kansas City, Missouri, posted on June 11 two photos of a "dinosaur" being transported by a trailer truck. The pictures got so much attention online that these now have 50,385 likes, 100,878 shares and over 28,000 comments. This is an outrage. This beautiful, endangered Tyrannosaurus Rex was bound to a trailer, unable to move for 30hrs. This is animal cruelty, at its worst. The perpetrators of this horrible act should be fined, and their rights to own exotic and domestic animals should be stripped from them. Please help me raise awareness about this heinous injustice. Dinosaurs are animals too, and they deserve our love and care. How would you feel if you were bound to the back of a truck for 30hrs? Share this photo and help bring a stop to cruelty towards our beloved jurassic friends. Some Facebook user wished the dino was real while others believe it was one of the props for the science fiction adventure film "Jurassic World." A few didn't get the joke.